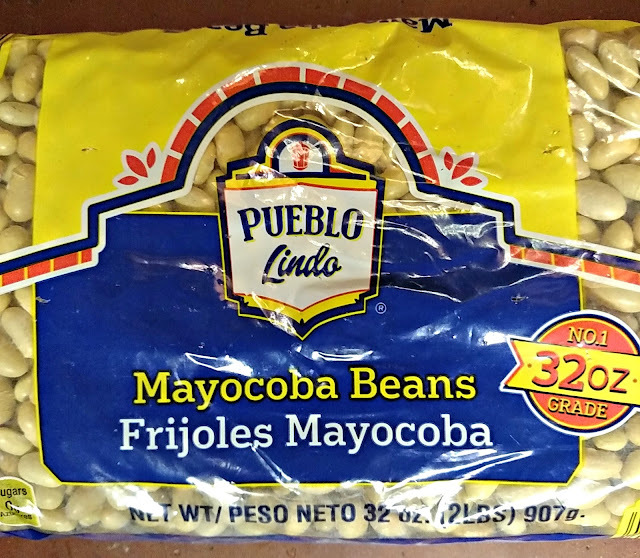 When I was at the grocery store I found these new beans I'd never heard of called Mayocoba beans (also known as Mayacoba beans). I cook a lot of beans, so I was interested to try them. At $1.80 for a two pound bag, they were cost effective. I couldn't find much in the way of recipes, so I ended up making one up. I did figure out that they are native to Peru. I put them in the slow cooker covered with several inches of water. I added a chopped onion, some chopped garlic, 2 tsp. of cumin, 1 tbsp. salt, and 1/2 tsp. pepper. Pretty simple. I cooked it on low all day (check around midday to make sure they don't need more water), until the last hour, when I turned it up to high. Then I mashed them with a potato masher. I served them with whole wheat cornbread and a swirl of sriracha sauce for heat. They were very tasty - similar to pintos. 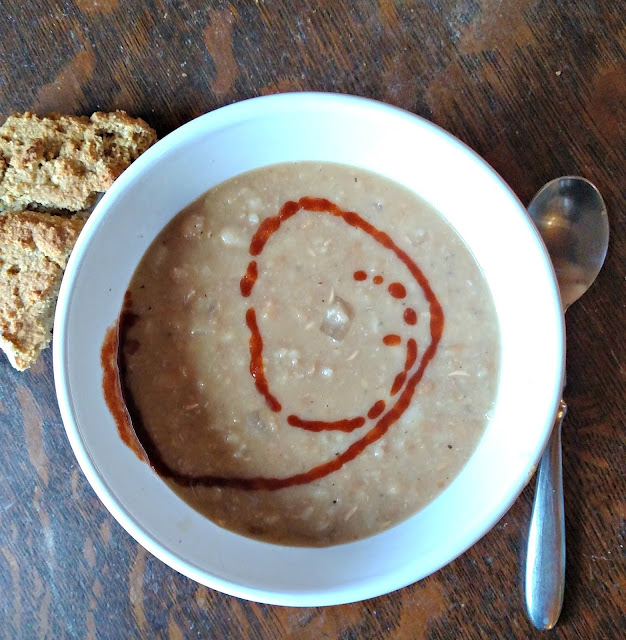 Readers, have you ever tried Mayocoba beans? Never tried these. I'd like to try some of the potato variants they have in South America as well. Good Morning, Lisa. I have not tried these beans but they look delicious and economical. I enjoy using the crockpot, so I'll be on the lookout for these beans. Enjoy your day. I've heard of mayocoba beans (aka Peruvian beans) but haven't found them around here... did look out some recipes under Peruvian beans and found some which looked quite tasty! I will have to look for them. I have grown a lot of heirloom dry beans. I haven't heard of them till now either, and beans are so good for us, I'll have to look for them! So comforting! And the sriracha is a nice touch. I haven't seen those, I will have to try them now if I can find them! Never tried it. My dad lived in Brazil for 4 years and when he got back to the states, he was done with beans and rice, period. We didn't get much of that growing up. It's been interesting to try new things in that realm, but I still hesitate--just because of his reluctance. I think my comment just disappeared... My dad lived Brazil for 4 years and by the time he got back to the states, he was done with rice and beans forever. I guess his reluctance kind of still weighs on me, but I'm trying. My hubby loves beans. I keep meaning to have a go at cooking dried beans, especially haricot beans which are a favourite ingredient in some French dishes. Never likely to get the Peruvian beans here though! I must look for them too Lisa - love beans and trying new recipes. We do have two Peruvian restaurants nearby and several local grocery stores have big Hispanic food sections, so I would most likely find them. Whole wheat cornbread sounds delish!!! I shall keep my eye out for these, lots of imported goods in a certain shop we frequent and there is a Pervian community near my MIL I will ask her to look to...peruvian beans in france now that is a journey. I've never tried them, but they look good!!! All of my kids love beans so I will definitely have to try this! There ya go! Good work! Never heard of them, but then, I lead a sheltered life. I don't think we've had these. They sound good. I love that sauce. We usually stick to black beans, kidney beans and pinto beans. We should branch out more.